What are the best tools for team collaboration? That’s a question we hear a lot these days – it’s being discussed in blogs, forums, and among teams of all sizes. No matter whether you work in a creative or development team, a well-oiled team communication is what keeps the wheels rolling. Right? The truth is that in order to attain the full potential of team-wide conversation, your team doesn’t need to find just a tool. You need to find the right tool. To make this challenging task easier for you, we’ve listed five team collaboration software famous for their teamwork-enhancing effects. Some of them you may already know while others might come as a sweet surprise. Scroll to the bottom of the article to see a helpful list of team collaboration best practices. A structured teamwork plan is ten times as effective as an unorganized one. We couldn’t help but start with this new tool that only recently hatched from its beta-egg. Notion is like and enhanced version of Trello, including features for task management on a kanban board, commenting, document handling, wikis, and much more. 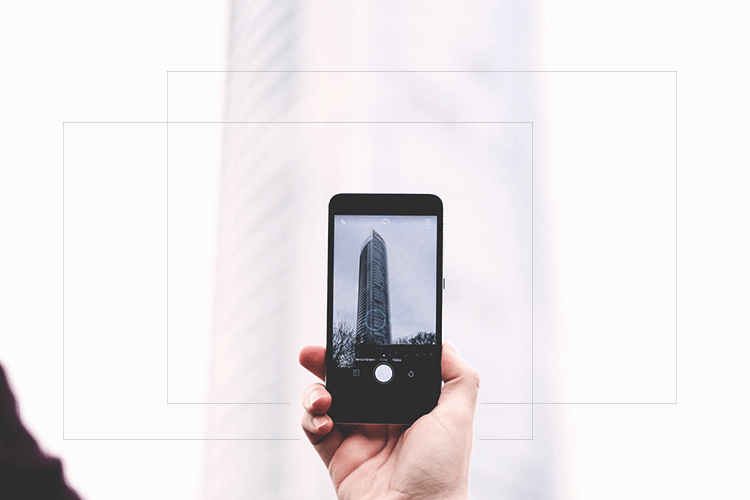 Is Notion suitable for your team? 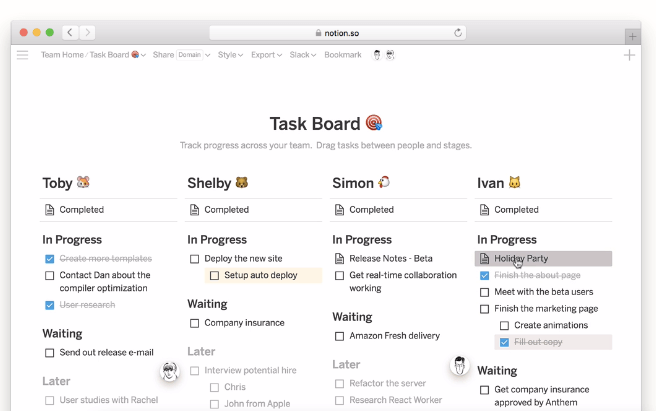 Notion is the team management software for fairly small teams that need to be seamlessly in contact to discuss projects, share files, and record ideas. 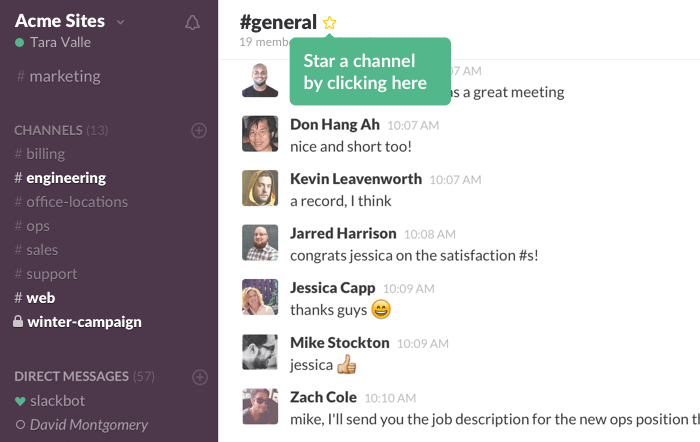 If you love using Slack, you can easily integrate it with Notion for a faster and streamlined communication. The best thing about Notion is that it serves as a personal weekly to-do list, a note-taking tool or a whiteboard for single users. I recently moved my weekly planning from Evernote to Notion, and I couldn’t be happier about my decision. So if you’re simply looking to improve your personal productivity and work smarter instead of harder, Notion is definitely worth testing. By the way, it’s free for personal use. 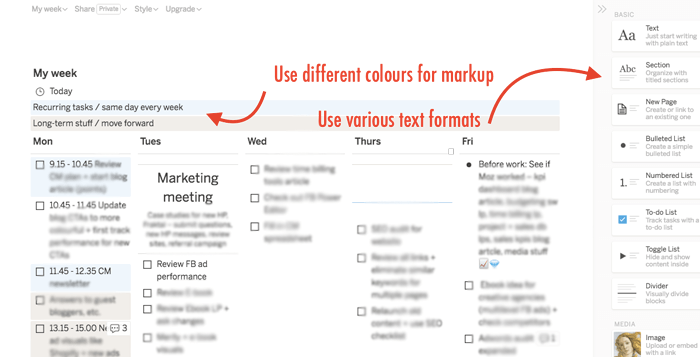 Tip: Use Notion’s weekly planner view to organize your to-do list. Top benefits: you can drag and drop tasks from one day to the next, use various text formats to create notes, checklists, etc., use dividers to bring more structure to your plans. If you’re working on projects where time is the most valuable resource, see this list of online time tracking tools. If your team’s all about sharing ideas and taking valuable notes at meetings, you might want to check out Evernote Business. It reminds of a huge virtual whiteboard, serving as a place for contributing ideas and knowledge. Is Evernote the right choice for your team? If you’re part of a team working on creative projects, Evernote’s shared notebooks make sharing ideas considerably easier. However, if you need to collaborate in real-time, you’ll need a complementary tool such as Slack or Skype. Companies handling project research can use the system to collect and store documents, links, multimedia, etc. You can even search for keywords in PDF and Word documents without specifically opening them. 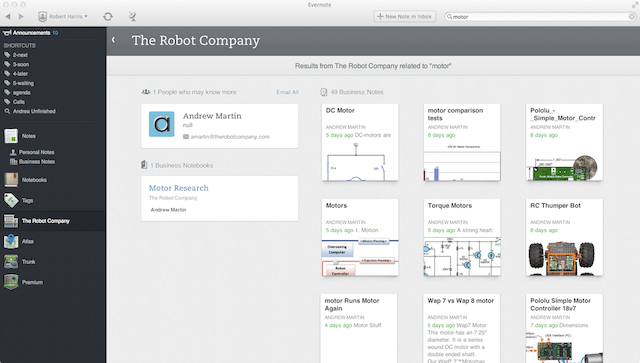 Tip: Use Evernote’s presentation mode to create idea boards and share them during the meetings. This list wouldn’t be complete without Slack, the king of all team communication tools. Slack mainly serves as a simple messaging app for teams but more often than not, people are only aware of 20% of Slack’s capacities. 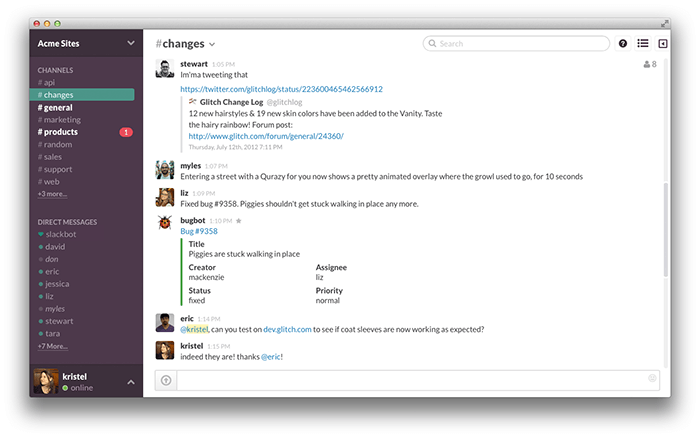 What else can you do with Slack in addition to real-time communication? Integrate it with Google Drive, Box or Dropbox to share docs, images, and files more quickly. You’ll end up sending fewer emails and keeping everyone’s inboxes decluttered. Set up reminders – type in /remind me [at/in] [some time] to [do something] into any Slack conversation to be notified at the right moment. Highlight words – go to You > Preferences > Notifications > Highlight Words and set up some words that you want to be notified about as they appear in conversations. Star your channels – hit the star icon that appears when hovering over the name of the direct message or a channel. The starred channel will now appear on a special starred items menu so that you can find it more quickly. Use Slackbots – get these tiny robots working in your service. Here’s a list of 190 Slackbots. 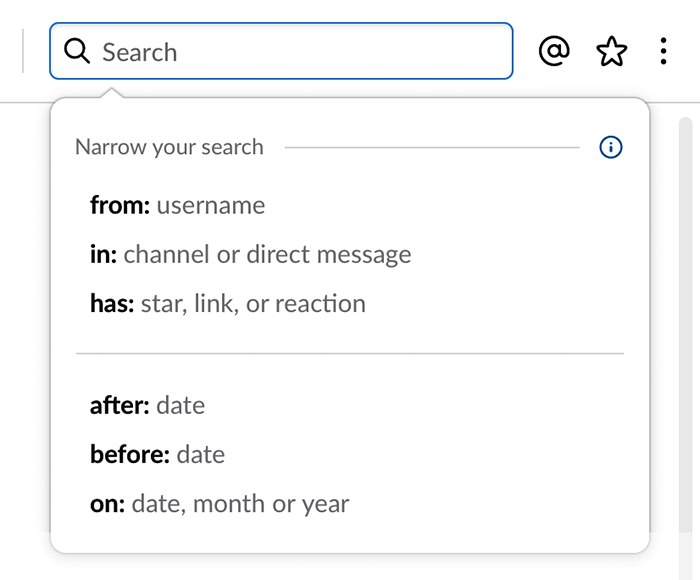 Use advanced search – search for particular channels, users, dates, or words across your Slack conversations. Before Slack came along, everybody was using Skype. And some teams still are to this day. 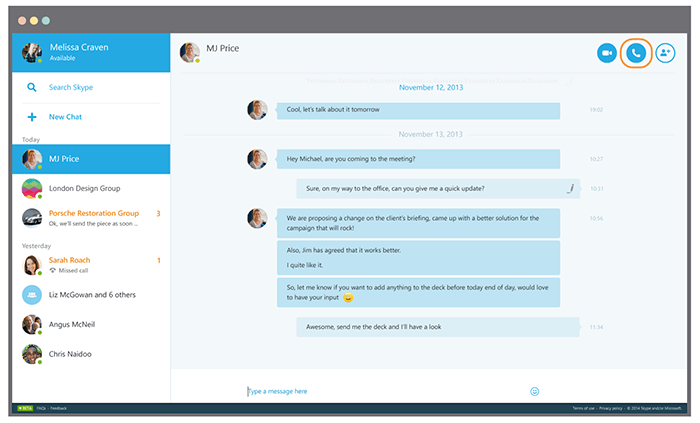 What makes Skype so popular is its useful combination of video chat and messaging. If you’re already using Skype for video calls, you could use it as a group collaboration tool without the need to set up an extra system. Is Skype the right tool for you? Skype serves as the perfect tool for team communication but lacks the features for project management. Combined with a tool like Notion (or Trello), you’ll have both the place to manage, share, and comment on ideas, and the system for fast communication. Did you know that Skype enables video calls with up to 250 people? If you’re a small team of fewer than 25 people, organizing video calls in even simpler (and free). Tip: If you’re participating in many Skype channels, it’s easy to miss out on important messages at the right time. To avoid missing out on conversations on specific topics, go to your notification center and set up keyword notifications. 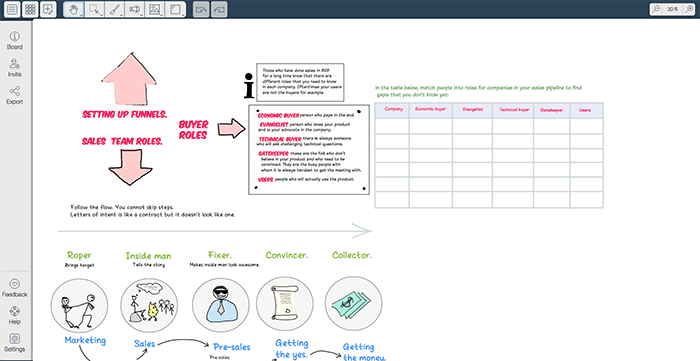 Online whiteboards stand in an ever growing marketplace with many new entrants. Deekit is one of the latest whiteboard tools to be added to this list. Like all other online board, Deekit is still in its infancy and thereby has a fairly rough and unpolished interface. But it works wonders when you need to explain a complex idea to many team members at once. If and when should you use Deekit? First of all, the whole concept of online whiteboard seems so interesting that you should check it out. With pre-created templates, you can quickly get the first impression of the tool’s capacities. If you often collaborate on SWOT analysis, business plan, visual projects roadmap, etc. and need to save the results online, Deekit should be your go-to tool. It is also a godsend to remote teams who simply can’t collaborate on real-life dashboards. Now that we’ve looked into five helpful tools let’s continue with three hacks that will make your team communication more efficient. Ready to save hours of time each week? In 2015, a Googler wrote a letter to their team, recommending a new way of looking at our workplace productivity. He told that we should all have a few hours every day called the Make Time. Make Time is a period when you can work undisturbed and completely focus on your most important projects and tasks. Nobody is bound to ask you anything or contact you with requests. Scheduling personal Make Time ensures that each team member can work seamlessly on an important task without being distracted by their colleagues. 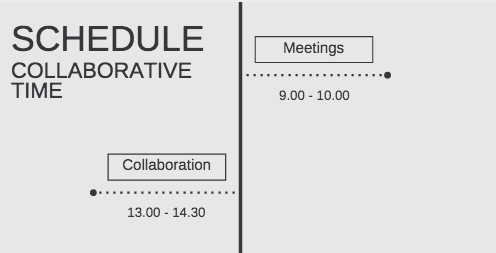 But what if everyone schedules their Make Time for different times of day, leaving you with no room for meetings? The best way to make your team collaboration constructive is to schedule two to three hours every day when everybody’s free to communicate with their teammates. Having pre-set collaboration time leaves at least 4 hours of distraction-free time when everybody can focus on their work. If people have questions to their colleagues, they can write them down and ask them in a bundle, instead of distracting another person each time a new idea comes up. We live in an age of digital disruption, using Skype, Facebook, Gmail, Messenger, WhatsApp, Snapchat, etc. in our everyday communication. Imagine everyone using different apps to write to their teammates. It means that you constantly need to keep your eye on all of these channels. Research shows that we already check our phones 85 times per day. Not very productive, right? Instead of being constantly waiting across all collaboration channels, decide on one particular tool that you’re going to use in team collaboration. For example, in Scoro we like to use Skype. Tip: Encourage all team members to turn off notifications for all other communication channels except the one you’ve agreed on using. Many team leaders think it’s best to have floating roles in the team but a clear vision of how to get to the goal. In fact, the opposite is true. A research found that teams with clearly defined roles and responsibilities but without the complete knowledge of how to get from point A to point B overperformed other teams. When a team acts according to its leader’s plan, many good ideas will go unnoticed. But if everyone is welcome to contribute their ideas and execute them freely, some untapped creativity will be unleashed. To test this approach, create an online whiteboard with a problem. Add to the whiteboard the point A (your current situation) and point B (where you’d like to be). Now invite all team members to contribute their ideas about how to get from A to B.
You’ll be surprised by how many new ideas people come up with when they feel that they have the power and trust to execute. Supportive and well-organized teamwork is invaluable. Realizing the full potential of each team member and providing them with the right equipment is one of the key traits of successful leadership. Pick the right tools, schedule the time for collaborating, and support each other along the way. What team collaboration tools do you use in your company? We’re working on an article about the favorite apps and tools of successful teams, so make sure to leave a comment!